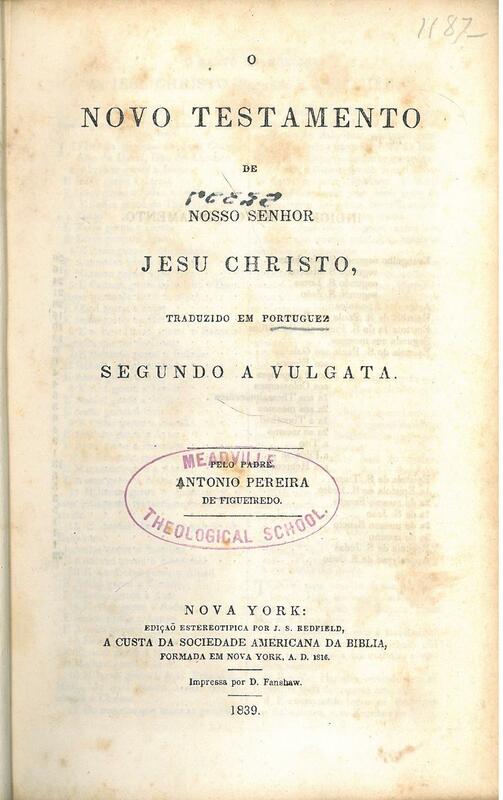 This is the first Portuguese New Testament published in the United States. It was translated from the Latin Vulgate and the text is Catholic but it does not contain any notes or an imprimatur. 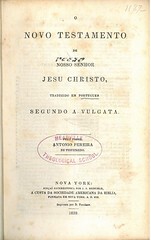 Title: O Novo Testamento de Nosso Senhor Jesu Christo, traduzido em Portuguez Segundo a Vulgata. Pelo Padra Antonio Pereira de Figueiredo. Nova York: Edicao Estereotipica por J. S. Redfield, a custa da Sociedade Americana da Biblia, forma em Nova York, A.D. 1816. Impressa por D. Fanshaw. 1839. References: O'Callaghan p. 264 entry 4. Comments: The copy at www.archive.org is the 2da edition so at least two editions of this were published.